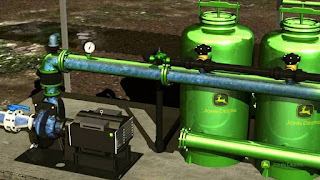 John Deere irrigation system is an irrigation solutions innovator, offering the global agriculture sector the broadest portfolio in the market and the most comprehensive range of services. John Deere brings real solutions to the field that enables farmers around the world to achieve higher quality crops more consistently and increase yields with greater cost efficiency, while managing water and land for inclusive and sustainable growth. John Deere offers a wide range of advanced tailor-made irrigation solutions to growers around the world. Every year location system begins with a water source. From there the water is transported through a pipe to the pumping station which builds the pressure in the system. The filtration system ensures that the water quality meets the crop needs. The fertilizing system provides nutrients to the plants and the controller manages the irrigation process. Once the control head is installed it can be connected to the main line which in turn delivers water to the different field sections. Each section has its own control head with a dedicated control valve and a filter. A hose or a manifold is deployed at the head of the section. The drip lines are connected to the hose or manifold and laid out along the crop rows. From the water source to the drip lines the system is now ready for operation. When the pump is turned on it draws the water into the pipe through the suction filter in the reservoir. The pump provides energy to the water enabling proper operation of the system. The filtration system blocks dirt particles promoting effective and long-lasting performance. The fertilizer palm provides precise amounts of nutrients required to meet the specific needs of the plant at each stage of growth. The control valve on the main line regulates the water pressure as it moves downstream into the field sections. The valve maintains the required pressure and ensures that each filled section receives the correct amount of water. The secondary valve is turned on according to the irrigation plan. The manifold is now filled carrying the water throughout the field to the preinstalled drip lines. The drip lines produce efficient and uniform flow delivering an equal amount of water to each plant. Supported by effective irrigation the crop seedlings can now emerge into the light and grow into strong and healthy plants. 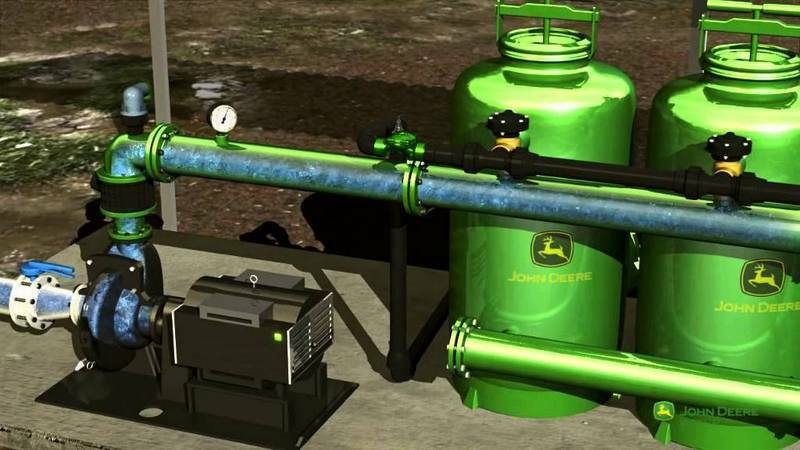 John Deere products deliver water where and when you need it throughout the irrigation season water you can't grow without it. 0 Response to "John Deere Irrigation System"